Robots can help lonely single children — the result of harsh Chinese rules on the size of families — grow up happy and healthy, android manufacturers claim. Beijing has recently allowed couples to have two children but rising costs have put off many prospective parents. 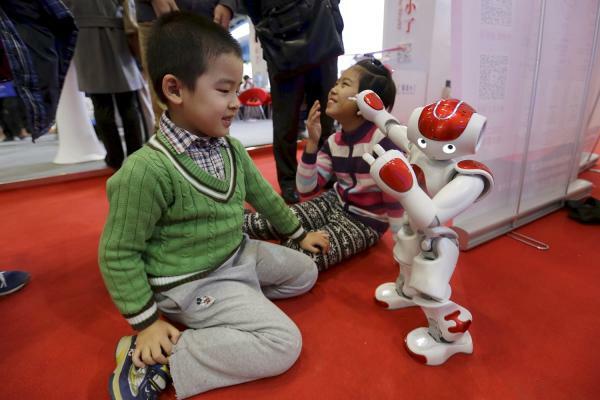 A robot is cheaper than a second child, Tan Longfei, of the Beijing Radish Technology company, said. For £200 Little Radish will sing, teach, play with youngsters, tell stories and adapt to its owner’s preferences, Mr Tan said. The robot will go on sale next month. Joining the December rush, for a similar price, is the Turing Robot, a classic robot figure inspired by Alan Turing, the British wartime codebreaker and pioneering computer scientist. “I respect him so much,” Jeff Yu, the founder of the Beijing Light Year company, said. “He’s the pioneer of the robot and artificial intelligence sectors.” If the product is successful, Mr Yu has promised to take his staff to Mr Turing’s former home in Hampton, southwest London. However, neither of these robots seems likely to pass the Turing test of whether a machine can fool people into thinking it is human. That is not stopping a robot boom in China, supported by a government that is desperate for new growth areas in a slowing economy. President Xi and Li Keqiang, the prime minister, wrote congratulatory messages to the World Robot Conference in Beijing this week. Li Yuanchao, the vice-president, told delegates that robotics was a high priority in the Made in China 2025 plan. The scheme is Beijing’s attempt to upgrade the economy and move into higher-value manufacturing. China is already the world’s biggest market for industrial robots but many entrepreneurs are banking on sales of androids for surgical and household jobs to bring in significant sales. Families are also looking to androids to carry out tasks around the home. Lucy Zheng, seven, looked longingly at Little White, which greets restaurant diners, takes orders and gives bills. “I want a robot to play with me, help do my homework and dance,” she said.